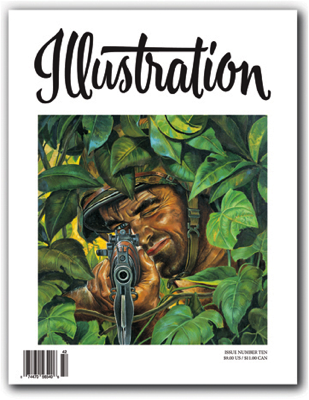 In this issue: The pulp cover art of illustrator Rafael DeSoto; a tribute to the life and work of Lone Ranger comic strip artist Tom Gill; the paperback cover illustration of Mitchell Hooks; the caricature art of Jack Lane; the exploitation paperback covers of Australian impring Horwitz Publishing. Book Reviews, Exhibitions and more round out the issue. 80 pages in full color. Sold out.